Chondromalacia patellae is one of the most frequently encountered causes of anterior knee pain among young people. It’s the number one cause in the United States with an incidence as high as one in four people. The word chondromalacia is derived from the Greek words chrondros, meaning cartilage and malakia, meaning softening. Hence chondromalacia patellae is a softening of the articular cartilage on the posterior surface of the patella which may eventually lead to fibrillation, fissuring and erosion. 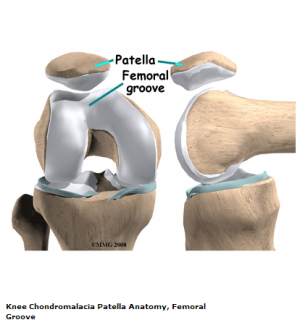 The differential diagnosis of chondromalacia include patellofemoral pain syndrome and patellar tendinopathy. Chondromalacia is are not considered to be under the umbrella term of PFPS. The pathophysiology is thought to be different and therefore there is alternative treatment. These muscles are active stabilisers during knee extension, especially the VL (on the lateral side) and the VMO (on the medial side). The VMO is active during knee extension, but does not extend the knee. Its function is to keep the patella centred in the trochlea. This muscle is the only active stabiliser on the medial aspect, so it's functional timing and amount of activity is critical to patellofemoral movement, the smallest change having significant effects on the position of the patella. Not only do the quadriceps influence patella position, but also the passive structures of the knee. These passive structures are more extensive and stronger on the lateral side than they are on the medial side, with most of the lateral retinaculum arising from the iliotibial band (ITB). If the ITB is under excessive tension, excessive lateral tracking and/or lateral patellar tilt can occur. This is can be as a result of the tensor fasciae lata being tight, as the ITB itself is a non contractile structure. . The Q-angle: or quadriceps angle is the geometric relationship between the pelvis, the tibia, the patella and the femur   and is defined as the angle between the first line from the anterior superior iliac spine to the centre of the patella and the second line from the centre of the patella to the tibial tuberosity . 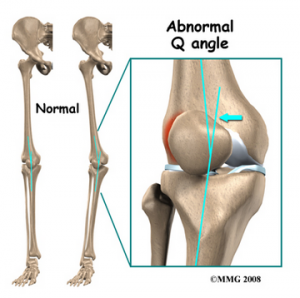 Q-angle: An abnormality of the Q-angle is one of the most significant factors of patellar malalignment. A normal Q-angle is 14° for men and 17° for women. An increase can result in an increased lateral pull on the patella. > Rectus femoris: affects patellar movement during flexion of the knee. > Hamstrings: during running tight hamstrings increase knee flexion which results in increased ankle dorsiflexion. This causes compensatory pronation in the talocrural joint. > Gastrocnemius: tightness will result in compensatory pronation in the subtalar joint. Excessive pronation: prolonged pronation of the subtalar joint is caused by internal rotation of the leg. This internal rotation will result in malalignment of the patella. Patella alta: this is a condition where the patella is positioned in an abnormally superior position. It is present when the length of the patellar tendon is 20% greater than the height of the patella. 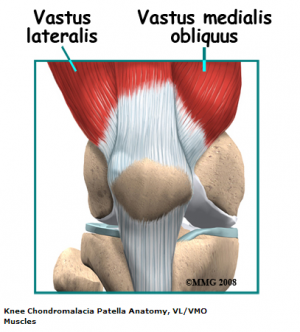 Vastus medialis insufficiency: the function of the vastus medialis is to realign the patella during knee extension. If the strength of VM is insufficient this will cause a lateral drift of the patella. Muscular balance between the VL and VM is important. Where VM is weaker the patella is pulled too far laterally which can cause increased contact with the condylus lateralis, leading to degenerative disease. Hip positioning and strength are linked to the prevalence of patellofemoral pain syndrome. Therefore, hip strengthening and stability exercises may be useful in the treatment program of patellofemoral pain syndrome. Stage 1: softening and swelling of the articular cartilage due to broken vertical collagenous fibres. The cartilage is spongy on arthroscopy. Stage 2: blister formation in the articular cartilage due to the separation of the superficial from the deep cartilaginous layers. Cartilaginous fissures affecting less than 1,3 cm² in area with no extension to the subchondral bone. Stage 3: fissures ulceration, fragmentation, and fibrillation of cartilage extending to the subchondral bone but affecting less than 50% of the patellar articular surface. Stage 4: crater formation and eburnation of the exposed subchondral bone more than 50% of the patellar articular surface exposed, with sclerosis and erosions of the subchondral bone. Osteophyte formation also occurs at this stage. Since its first description by Budinger in 1906, chondromalacia patella has been of significant clinical interest because diagnosis is often difficult. The chief reason for this is that the aetiology is often unknown and the correlation between the articular cartilage changes and the clinical system is poor. Patients affected by chondromalacia patella are young, between 15 and 35 years old, and many are highly active and are often considerably disabled by the symptoms of aching behind the patella, recurrent effusion of the knee, knee instability and crepitus. The primary diagnostic approach for chondromalacia patellae is radiography with added arthrography. Pinhole scintigraphy, part of arthrography, is also used to diagnose the condition. MRI is an effective, non-invasive method with the ability to increase the sensitivity and specificity of the diagnosis. Anterior Knee Pain Scale: a 13 item questionnaire with categories related to various levels of current knee function. The five KOOS subscales: a scale about patients' experience over time with knee conditions. It consists of five subscales: Pain, other Symptoms, Function in daily living, Function in sport and recreation and knee related Quality of life. Examination of the knee is 4 fold: observation, mobility, feel, X-ray. Observation: joint appearance is usually normal, but there may be a slight effusion. Mobility: passive movements are usually full and painless, but repeated extension of the knee from flexion will produce pain and a grating feeling underneath the patella, especially if the articular surfaces are compressed together. Feel: Pain and crepitus will be felt if the patella is compressed against the femur, either vertically or horizontally, with the knee in full extension. By displacing the patella medially or laterally, the patellar margins and their articular surfaces may be felt. Tenderness of one or other margin may be elicited and more frequently the felt medially. Resisting a static quadriceps contraction, will generally produce a sharp pain under the patella. This may be apparent in both knees, but more severe on the affected side. Patellar grind test or Clarke’s sign: This test detects the presence of patellofemoral joint disorder. A positive sign on this test is pain in the patellofemoral joint. Extension-resistance test: This test is used to perform a maximal provocation on the muscle-tendon mechanism of the extensor muscles and is positive when the affected knee demonstrates less power to when trying to maintain the pressure. The critical test: This is done with the patient in high sitting and performing isometric quadriceps contractions at 5 different angles (0°, 30°, 60°, 90° and 120°) while the femur is externally rotated, sustaining the contractions for 10 seconds. If pain is produced then the leg is positioned in full extension. In this position the patella and femur have no more contact. The lower leg of the patient is supported by the therapist so the quadriceps can be fully relaxed. When the quadriceps is relaxed, the therapist is able to glide the patella medially. This glide is maintained while the isometric contractions are again performed. If this reduces the pain and the pain is patellofemoral in origin, there is a high chance of a favourable outcome. It is possible to diagnose incorrectly and these tests may aid in determining chondromalacia, but other possible conditions also need to be excluded. Chondrectomy: also known as shaving. This treatment includes shaving down the damaged cartilage to the non damaged cartilage underneath. The success of this treatment depends on the severity of the cartilage damage. Drilling is also a method that is frequently used to heal damaged cartilage. However, this procedure has not so far been proven to be effective. More localised degeneration might respond better to drilling small holes through the damaged cartilage. This facilitates the growth of the healthy tissue through the holes from the layers underneath. Full patellectomy: This is the most severe surgical treatment. This method is only used when no other procedures were helpful, but a significant consequence is that the quadriceps will become weak. Replacement of the damaged cartilage : The damaged cartilage is replaced by a polyethylene cap prosthesis. Early results have been good, but eventual wearing of the opposing articular surface is inevitable. Simply removing the cartilage is not a cure for chondromalacia patellae. The biomechanical deficits need addressing and there are various procedures to aid in managing this. Tightening of the medial capsule (MC): If the MC is lax, it can be tightened by pulling the patella back into its correct alignment. Lateral release: A very tight lateral capsule will pull the patella laterally. Release of the lateral patellar retinaculum allows the patella to track correctly into the femoral groove. Medial shift of the tibial tubercle: Moving the insertion of the quadriceps tendon medially at the tibial tubercle, allows the quadriceps to pull the patella more directly. It also decreases the amount of wear on the underside of the patellar. Although there is no overall agreement for the treatment of chondromalacia, the general consensus is that the best treatment is a non-surgical one. Hip strength and stability training, as hip positioning and strength has a significant influence on anterior knee pain. Ice may be useful for reducing pain in an acute flare up, but not as a long term treatment protocol. NSAIDS may also be of benefit in the short term to relieve pain so that knee function and mobility is normalised and an exercise programme can begin. Supporting the patella and knee joint by bracing is a further way to reduce pain and symptoms, but it will also alter patella tracking and reduce active function of the quadriceps. Bracing may be useful in the short term to offer patients some support and pain relief to help them avoid antalgic movements and normalise gait as much as possible. Bracing can also be used for patients pre- and postoperatively, but a brace should allow variation in medial pull on the patellar and pressure. (Level of Evidence 1A ) Wearing a patellar realingment brace and following physical therapy has a synergistic effect on patients with chondromalacia patellae. Using a foam roller cab be useful for relieving tight musculature and reducing pressure over the patella. .
↑ 6.0 6.1 Wiles P, Andrews PS, Devas MB. Chondromalacia of the patella. Bone & Joint Journal. 1956 Feb 1;38(1):95-113. ↑ 8.0 8.1 Fernández-Cuadros ME, Albaladejo-Florín MJ, Algarra-López R, Pérez-Moro OS. Efficiency of Platelet-rich Plasma (PRP) Compared to Ozone Infiltrations on Patellofemoral Pain Syndrome and Chondromalacia: A Non-Randomized Parallel Controlled Trial. Diversity & Equality in Health and Care. 2017 Aug 4;14(4). ↑ 23.0 23.1 23.2 LOGAN A. L., The Knee Clinical Applications, Aspen Publishers, 1994, p. 131. ↑ George Bentley, Ian J. Lesly and David Fischer. “Effect of aspirin treatment on chondromalacia patella” Annals of the rheumatic diseases, 1981, 40, p37-41. ↑ Crossley, Kay M., et al. "Analysis of outcome measures for persons with patellofemoral pain: which are reliable and valid?." Archives of physical medicine and rehabilitation 85.5 (2004): 815-822. ↑ Huang J, Li L, Lou BD, Tan CJ, Liu Z, Ye Y, Huang A, Li X, Zhang W. [Efficacy observation on chrondromalacia patellae treated with fire needling technique at high stress points] Zhongguo Zhen Jiu. 2014 Jun;34(6):551-4.